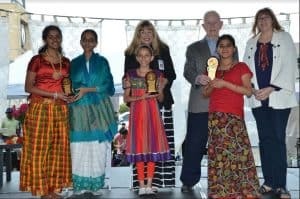 Several dignitaries attended the event including Congressman Mr. Pete Olson. 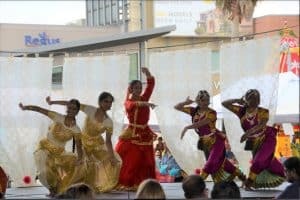 He praised the contribution of the Indian/Asian community in general, and of Global Organisation for Divinity specifically, to the vibrant, growing diversity of Pearland and Houstan areas. 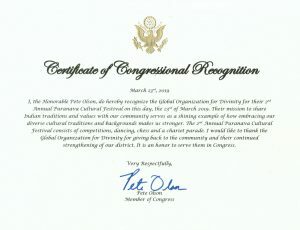 In recognition of this contribution, he provided Global Organisation for Divinity with a Certificate of Congressional Recognition that appreciated our organisation’s contribution to the strengthening of the district and for giving back to the community. 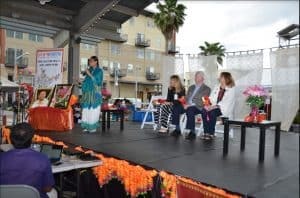 The other dignitaries who attended the event included, the Mayor of Pearland Mr. Tom Reid, Mayor of Manvel Ms. Deborah Davison, Executive Director of Pearland Convention and Visitors Bureau Ms. Kim Sinistore, City Council member Mr. Gary Moore, President of Hindus of Greater Houston Ms. Thara Narasimhan, and our very own Lead Trainer and Representative of Global Organisation for Divinity India Sri Poornimaji, senior disciple of HH Maharanyam Sri Sri Muralidhara Swamiji. Visitors also got to shop at various vendor booths by local and home-owned businesses; try on the traditional Indian sari; take professional pictures courtesy Digital Cowboy Pro; and taste delicious Indian vegetarian food thanks to Kicha’s Kitchen (G.O.D.’s volunteer-run nonprofit kitchen) and Sangam Chettinad Indian Cuisine. 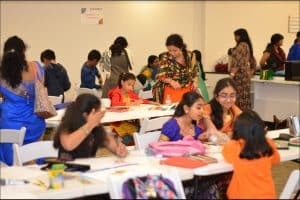 Cultural exhibits representing different regions and states of India were also on display thanks to Houston Kannada Vrinda, Universal Shraddha Foundation, Sri Guruvayurappan Temple and G.O.D. volunteers. 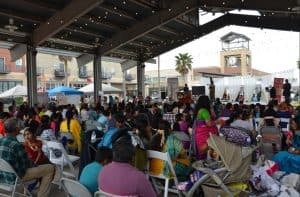 Everyone was amazed at the event timings, the wonderful weather and overall happy ambience during and after the event. Humble gratitude to Guru Maharaj, whose grace was evident throughout the event!